This month, UPPERCASE magazine— an artful, beautiful, inspiring publication— asked for submissions with the theme "Office Types." 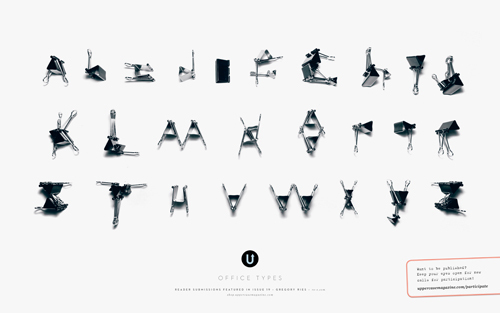 Readers submitted alphabets and letterforms made from office supplies. Check out the clever binder clip alphabet by Gregory Ries! Download all the desktops featuring staplers, sticky notes, and paper clips right here, plus lovely backgrounds with other themes. Thanks for the post! Love the name of your blog. Janine always tells me 'when in doubt, pick orange'.